Are you looking for an inexpensive solution to make your favorite cup of espresso at home? Or, would you prefer a cup of latte in the morning without breaking your bank? Introducing AICOK! A cheap solution to make the perfect morning coffee without going to a coffee shop every day. They have a huge lineup of products, and frankly, not all of them are worth buying. 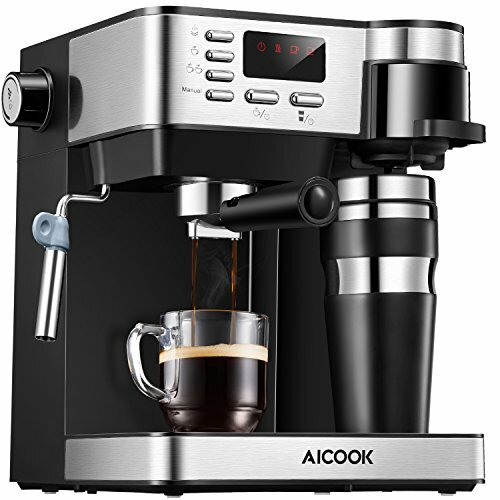 The main focus of this Aicok espresso machine review is to find the best product for value and compare them to see how well each of them performs in terms of durability, ease of use and taste. This is a semi-automatic 15 bar espresso machine with a manual brew size. It’s a nice all-in-one package to make Cappuccino, Latte or Moka at home. It also comes with a milk frother. With this machine, you can brew a variety of coffee at home and not have to spend a whole lot of money at coffee shops. It features a stainless-steel body for increased lifespan of the machine. The machine itself is not so big and doesn’t take a lot of space on your countertop. It’s also lightweight compared to other espresso machines at a similar price point. It also has a funnel with ergonomic handle. Keep in mind that when locking the funnel, you need to hold the espresso machine with one hand to ensure the funnel is fully locked. Easy turning-based operation knob for making coffee and steaming milk. Turn the knob all the way to the left to start brewing coffee and turn it all the way to the right for using the frothing device. Keep in mind that this is an entry level machine but does the job pretty well. It’s quiet and very easy to set up. It comes with easy to read instructions and a little cheat sheet for you to adjust the amount of coffee and the strength. Making coffee on this is much easier than a single-serve coffee brewer. It’s also eco-friendly because it doesn’t require any pods. To make coffee, press the power-on button, and a red light will start blinking. It will heat the water to the ideal temperature, and when the water is ready, it will flash the green light. The water filter is on the back which is easily removable. For making steam, press the green second button and the green light will indicate when you steam is ready. It’s a good idea to preheat your cups. It will make your espresso taste better. Put freshly ground coffee on the pot and press the grounds with the tamper. Turn the knob all the way to the left and your coffee will come out. You can control how much coffee you want in your cup. That’s all there is to it. It’s a highly recommended machine. Turn the knob all the way for the machine to work properly. The multifunctional coffee machine saves you space on your countertop by combining a drip coffee maker and an espresso maker in one compact machine. It is not just a regular espresso machine; it also does drip coffee pretty well. This one also has a milk frother on the side. This is the first time I’ve seen from Aicok that a machine does a regular drip coffee along with espresso. That also makes this machine pretty versatile. It comes with its own little travel mug. This coffee machine comes with its own little travel mug. It’s a 12-ounce cup with a travel lid. I do like the fact that this cup is tall and you can easily put your tall mugs in there instead of using this travel mug. This feature comes in handy when you have to make your coffee fast and ready to go to work with that mug. On top of the mug holder, you have your drip coffee compartment. It comes with a refillable filter. That saves you money right there. On the other compartment, you have your normal espresso holder. One cool thing about this machine is that it comes with two different containers for putting ground coffee. The smaller one is for making 1 cup of coffee, and the larger one is for making 2 cups of coffee. It takes the guesswork out of how much coffee you need to put in there. At the very side of the machine, you have your frothing wand. It’s actually movable, and when not in use, you can push it inside the machine and save space on the side. On the back, you have the water tank with indicators. This makes it easy to fill it up with the right amount of water. You can fill it up without removing it, or you can take it out to wash it. Speaking of washing, the drip catcher is also removable and easy to wash. On the front panel, you have all the control buttons with a mini display. The button with the tall mug icon is for the drip coffee. The middle one is for espresso. The top button with a frothing icon is for steaming and frothing milk. The following buttons are for how much coffee you want to make. Keep in mind that it’s a single serve coffee machine and can make one cup at a time and up to two cups. You also have the option to brew manually. Just push the button, and the coffee will start to pour down until you stop the brewing. The coffee comes out nice and rich in flavor with a lot of foam on top. It does take a few minutes to warm up, but the drink it produces is rich in flavor. The drip coffee side of it is not something I would buy the machine for, but it’s good enough. I like the steam knob on the side. It allows you to regulate the steam freely and make fantastic foamed milk. 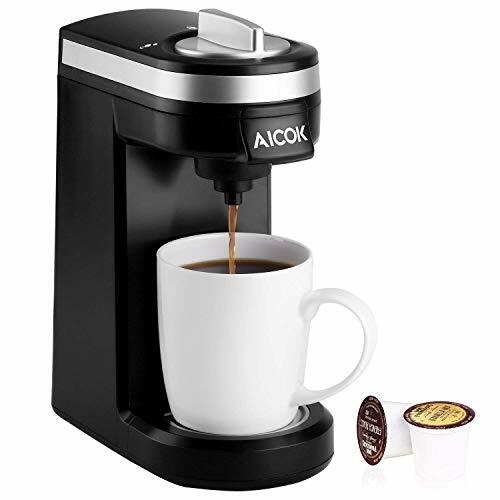 The combination of Aicok single serve coffee maker, and their drip maker is what makes this machine worth the money. It is very versatile and easy to use. Always ready to use with two separate heat pipes that control the temperature. The nozzle is not height adjustable. This is a single serve coffee pot brew station from Aicok that would be wonderful for travel. It’s very small and does best at what it was supposed to do. And, that is to make rich and tasty cup of coffee. It has a space saving design, really lightweight and easy to use. If you ever wanted to take your coffee machine with you, this might just be the one. It’s small and very portable. This coffee maker is designed to work with most K cup coffees including the reusable ones. The reusable k cup coffee filter is not included. Because of the Quick Brew Technology, from heating to brewing, it takes about 2 minutes to make a single cup of coffee. Durable construction using stainless-steel for longevity. Like all the other single serve machines, this too has the drip tray, and drip catcher and the whole compartment is removable for easy cleaning. Open the top lid, and you will see two separate spaces for pouring water and putting coffee. The water tank can hold somewhere between 150 to 250 mL of waters which is enough for a half cup to a full cup of coffee. On the front is where you put your K cups. There are certain K cups that you can use as well that will work with this. It has a handy lock and unlock feature on the top. This also makes cleaning the machine much easier. If you ever forget how to use it, there is actually a nifty set of instruction on the machine. It takes anywhere between 30 seconds to a minute for the water to heat up. Once you have everything good to go, you press the button on the side, and then it not only starts to heat the water up but then percolates your coffee. It takes about a minute or two to make the type of coffee that you are using to get your single serving cup. The machine heats up water just at the right temperature for drinking. Brewed between 192 to 205 F and served between 170 to 195 F.
Compatible with reusable K cups. Fast brewing at an ideal temperature. No water level indicator and holds just enough water for one cup. The great thing about this product is that it is a single knob machine. No more fancy dials and buttons. Plain and simple. 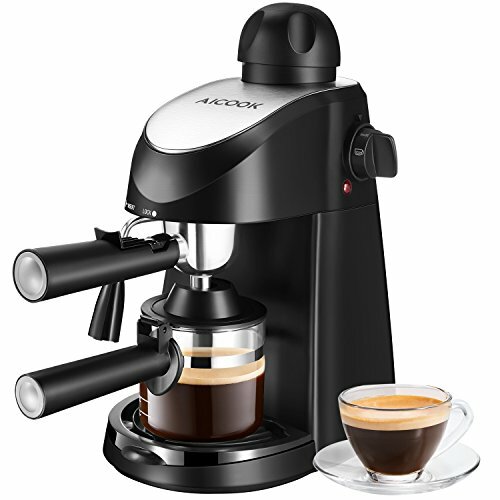 With this one, you can make up to 4 cups of espresso coffee at a time or 240 ml. It is super easy to use, and the 3.5 Bar pressure can make really superior tasting coffee. As I have told you before, the steam pressure is 3.5 Bar, and the frothing wand is on the side of the machine. It’s completely manual so that you can make creamy cappuccino bombs. The whole kit comes with everything you need to make coffee, espresso, latte, cappuccino, and other stuff. It has a small design, and it’s perfect if you want to put it in the kitchen or your office. It will fit anywhere. The construction uses a combination of hard plastic and stainless steel. The built-in frother warms up quickly and froths milk fast. It’s always ready to use at the turn of a knob. Speaking of the knob, the whole machine can be operated using the single switch knob. Brewing, pouring coffee, steaming everything is done by turning the knob left to right. The coffee staff is equipped with a safety clip for easy operations. The funnel device is also detachable and easy to clean. On top of that, it has a permanent filter basket which saves you money, and you don’t need to buy any additional reusable filters. The nozzle and the drip tray are removable which makes it easier to keep clean. The decanter or carafe whatever you want to call it can easily hold 4 cups of coffee. There are markings on the carafe that takes the guesswork out of how much coffee left. This machine is not suitable for making coffee with a fresh grinder. You need to use medium size coffee ground for this. It comes with a tamper and doesn’t support coffee pods. The coffee pour gives you decent crema on top the espresso, and it’s quite astonishing for a machine of this price range. Make sure you turn the handle to lock position. You will see the logo lit up on the head of the machine. It can brew up to 4 cups. You can’t see how much water you have poured. Finally, a Barista quality espresso machine that lets you make restaurant quality coffee at home. You can use it to make espressos, cappuccinos, and lattes. On top of that, it has an automatic milk frother. The best part is that you get to customize the temperature and the steam. You know it’s in your drink, you get to make it the exact flavor and a the exact temperature. It’s all automatic. You don’t need to stand in front of the machine all the time. The machine will do everything for you. 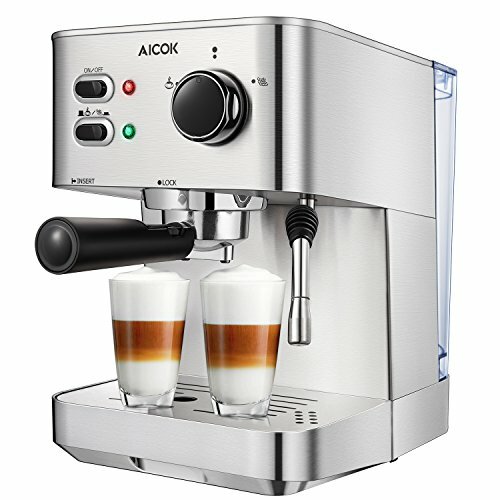 Aicok has been making good quality coffee machine lately, and this is one of them. When you look at it, it looks like the machine that you see at your gourmet coffee shops. It’s going to give you gourmet results. The whole unit comes in a complete package. You don’t need to buy anything separately. It comes with two portafilters. One for a single shot and another is for a double shot. You have your adjustable tray on the bottom and a removable milk reservoir. On the top, you have the one-touch operation controls. Literally press the button once, and you are good to go. You will see seven buttons there. Six of them are for making espresso, cappuccino, and latte and the other one is for cleaning the interior. Let’s talk about the water reservoir. It’s a large 1.8L capacity removable water reservoir. I love the fact that you can bring it to your sink and don’t have to fill it up at the machine. Then pour milk of any flavor or type in the milk reservoir. After that, fill up the portafilter. Tamper it with the dedicated tool. It comes with the tamper and the scoop. Finally, put the put the portafilter in the brew head and turn it so that its locked firmly. Move your dupe dispenser. That’s going to froth milk and steam milk. Put your cup down and press whatever button you desire. It’s a 15-bar pressure machine. Which means these 15 bars of pressure doing that espresso just like you would find in those coffee shops. Also, at the same quality and taste. You have the ability to choose your own grounds; you are grinding your own coffee beans. You can customize your drink however you want. The frother works like a charm and takes the guesswork of how much milk you should put in your drink. Don’t worry if you have forgotten the ratio of milk to coffee. Froth control knob to adjust the foam level. Automatic milk frother and also removable. Less control over the brewing. Aicok is known for making products that bring your family closer together. They specialize in making coffee makers, steamers, juicers, kettles, grinders and many more. They know how to make premium products, and their coffee maker category is known for durability. 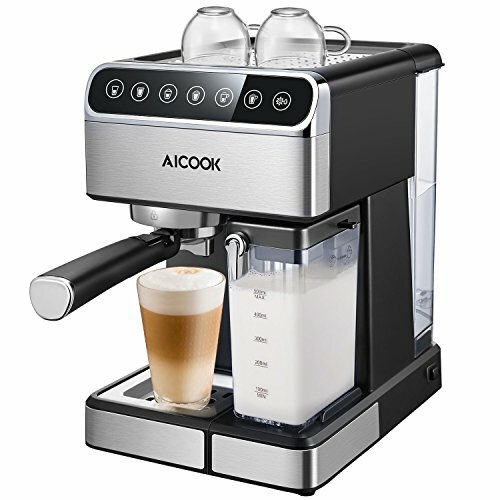 In this Aicok espresso machine review, I tried to highlight some of their best-selling and performing products for you to choose and decide on the product that suits you the most.